This hand-pieced soap flower has varying colors of petals creating a range from yellow to melon. The petals match the scrumptious mango papaya fragrance and a petal stand is also included. You'll feel as if you're bathing in a garden tub surrounded by fragrant blooms. There at least 35 hand-cut, hand-pieced petals in this design and you can use one petal for an average of 10 hand washes, bathing, shaving, as a guest soap, or as a travel soap. The creamy petals moisturize while cleansing and by using a single hand-pieced petal means that the rest of your flower stays together for the next experience. This soap flower is about 5 inches in diameter and approximately 3 inches high. 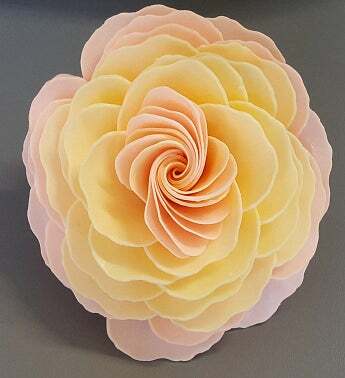 This hand-pieced soap flower has varying colors of petals creating a range from yellow to melon. The petals match the scrumptious mango papaya fragrance and a petal stand is also included.